Do you know how to grow your traffic and visibility on Pinterest? Using these top 5 tools for Pinterest, you’ll get more shares, saves, and ultimately, rank higher on the Pinterest search and smart feed for your creative small business. Discover my favorite tools for Pinterest marketing! If there is one thing every business owner can relate to, it’s juggling a million balls in the air: social media, marketing, SEO, blogging, emails (oh, the emails), client work, etc. If you follow me, you know the phrase I like to use (but didn’t coin! ): work smarter, not harder. As a mom to three, efficiency is key and my Pinterest marketing strategy, if it is going to succeed, needs to be income and traffic generating for my business. If something isn’t doing those things, after an extended period of time, then it has to go! Luckily, I have discovered some hard-working Pinterest marketing tools! I’m sharing these fabulous tools with you and how I use them. This one was a total gimme right? I talk about Tailwind all the time (and even have a course on it!) because it is the KEY to maintaining a robust Pinterest marketing strategy. Do I manually pin? All the time! I visit Pinterest daily and live pin, but Tailwind ensures that my content is being pinned at regular intervals to the boards that matter most. Looking for my top posts on Tailwind? Check out this link here! Ready to get a free trial and $15 off your Tailwind subscription? Visit my affiliate link here! Why did I separate Tailwind Tribes from Tailwind? Simple— they operate differently. 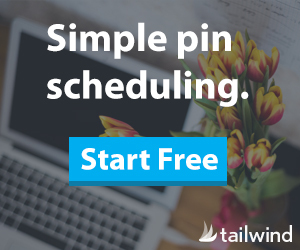 Tailwind’s smart schedule ensures that I am pinning my own pins as well as others, but Tailwind Tribes allow me to find great content within niche related communities. I love Tailwind Tribes for getting quick traction on my newest content or blog posts. When other’s pin your content via Tailwind Tribes to Pinterest, it shows Pinterest that you have content worth sharing and gives you authority. Sharing is caring. Learn more about Tailwind Tribes here. If you’ve joined my email list (which you can do here), you probably signed up using a specific opt-in landing page. Landing pages have a much greater ROI (return on investment) because it not only tells you what you are getting, in this case, my free Pinterest Start-Up Guide, but it shows you how it can help. I can detail so much more about what they are signing up for (plus design wise, it has an incredible presence). If you are a WordPress user, I love and use BluChic landing pages. Why am I mentioning my email list and landing pages as a tool for Pinterest? Unless you are only interested in page views, email marketing is the premier way for someone to get to know you regularly through an email list. Nurturing your email list will help you convert that bouncy Pinterest traffic into sales and client inquiries. Find out how to use Pinterest to grow your email list here. Optimizing your posts on your website for SEO is just as important as your Pinterest description on the platform. In the past, Pinterest would grab whatever description was available to describe a pin. Ideally, you would be adding the “data-pin-description attribute “ to every post. If you want a tutorial for the coding, you can read about it from my friend, Kristie Hill here. Most of the people I work with don’t want to deal with the coding and the tech. Enter WP Tasty Pins. WP Tasty Pins is a WordPress plug-in that allows you to add a Pinterest description (with hashtags) in addition to a properly keyworded Alt tag. You can even disable some pins from being pinned (if you don’t want it shared on Pinterest). This plug-in is a time-saving feature that ensures that my images are friendly on both Google and Pinterest. Canva is a free online graphics tool I use everyday! Not a graphic designer? No problem! Create beautiful (and optimized) pins on Canva using their Pinterest templates. Having beautiful and actionable pins is key for a solid Pinterest marketing strategy! You can find more tips about Pinterest pins here. These 5 Pinterest marketing tools help me to maintain an active and effective Pinterest marketing strategy! I hope they are helpful to you too!